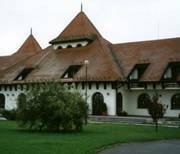 Cycling Holiday in Hungary visiting Thermal Spa Baths. Cycling in a kilt near Lake Balaton. Festetics palace, museum and Helikon library at Heviz. Wild flowers of Hungary as seen along the cycle route. We went on a one week cycle tour holiday, on the flat, alongside rivers, woods, vast fields and flat plains to the east of Budapest in Hungary. Led a very knowledgeable local English speaking guide and followed by driver, with support minibus for our luggage. 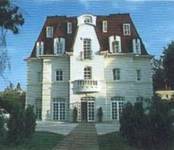 Daily hot thermal water spa baths allowed us to relax, drink champagne and gaze up the stars and satellites. Cycling Grade=1 (easy) .....Total cycling distance 233 km. Saturday, arrived Hotel Walzer, Budapest. If you arrive early there is an opportunity to visit the Budapest thermal baths before your start your Hungarian cycle tour. 6pm briefing and city tour by bus. 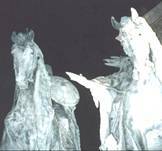 Hero's square, Hungary was formed by seven tribes from Siberia in 872, many Kings and temporary (sometime long) occupations since. Viewpoint across the Danube later. Sunday:. Bus 95km east from Budapest to dyke alongside the Tisza river to the north of Szolnok. Cycled via Nagykoru and Kotelek. Picnic lunch and water powered ferry crossing. On to Kunhegyes and stay in private houses (now Hotel). Outdoor music, lace and basket making. First thermal bath with hot water pouring from pipe coming up out of the ground. Lots of noisy frogs heard while walking back to the private house, late at night. 47 km today. Monday. Kunhegyes. Very good breakfast at private house. Tribal leader on horse in the town square, shooting arrow eastwards (towards Russia!). Large white church, we climbed into the roof, ate ice cream outside, cycled via Abadsolok to Tiszafurad along top of dyke to find holiday area with water flume ride, the along dyke to nature conservation area with many moored boats. Hot picnic lunch cooked at almost empty camping site sitting at comfortable table under trees. Then near Tiszaentimetre across railway and through Kunmaderas to Hotel Panorama at Tiszaors-Furdo. Through gate opposite to thermal baths open all evening, night and morning. Total 43km today. Stop for drinks and biscuits on cycle tour. Wednesday: Horse carriage ride, horse riding, truly organic grey cattle, sheep with twisted horns and pigs. Set off on bikes. 9 arch bridge, visitors centre/museum, via several poor remote farms. The concrete cycle track had a few unusual bumps. Picnic lunch after Balmazvjaros alongside quiet river. Enormous loaves of bread. Snooze in the sun under a line of trees, alongside canal. Eric went to see if there were any walnuts on the ground from last year (none). 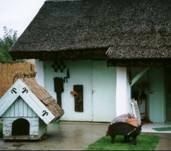 Then to Trofors Hunting lodge hidden in woods with fishing lake about 3km north of Nadudvar. 52km today. Evening meal outside. Evening bus to pool. Best so far with plenty of champagne, stars and satellites to watch. Massage/sauna. Thursday: Cycled into Nadudvar to see local black pottery making. Then 10km south to Kaba Thermal bath in town. Kaba is famous for its meteorite which exploded with fragments all over the place on April 15th 1857. Large open grass area, nice new brick walkway around pools. Lunch cooked in large witches cauldron under shady trees. Natural gas flare tower. Afternoon route partly off road but not difficult. Chris did tumble bumpkin beside bridge while walking down steep slope with bike pulling. (All mended now.) Arrived Hajduszoboszio town at enormous thermal baths with 17 pools and plenty of tiling and stainless steel. Ice cream before bus back to Trofea Hunting Lodge. 38km cycling today. Friday: Breakfast in the Kings Room with gallery, wooden panelling. Bus back to Budapest, afternoon in town using No 8 local bus to Elizabeth Bridge - food market. Final evening meal. Thanks to all. Saturday morning: Departure, although some stayed on to visit Gellert bath, music concert, library, museums etc. The first spa tour of 2002 came with warm, sunny weather and skies clear and blue. and we all had a good time even getting a tan. When the sun grew much hotter and the wind blew much stronger the Hungarian kilometre grew very much longer. we could always find the next satellite. we were urged on by Vitamins quite alcoholic. Like an acrobat she tumbled down, Got to the bottom and felt such a clown. Then MaryJo went into the pool she lost her clothes and felt a fool. The lady in white searched every box till at last she found MaryJo's socks. kaum sind wir da, müssen wir Ungarn schon verlassen. von uns aus könnt' es weitergehn. der Sattel hinterließ trotzdem seine Spur. wie gut, dass es soviel Bäder gibt. teils von außen, teils von innen! der Reiher seine Flügel schwingt. ließen uns den Alltag schnell vergessen. dass wir nie mehr wiederkommen, das glauben wir kaum. Any comments please e-mail eric@satsig.net. Many thanks to contributors for pictures and text.